The second HMS Ganges was a 2nd rate line-of-battle ship of 2,284 tons, rated at 84 guns but pierced for 92, with a ships company of 800. Built of teak at the Bombay Dockyard under master shipbuilder Jamsetjee Bomanjee Wadia. Admiralty orders of 5th June 1816 directed her to be built as a facsimile of HMS Canopus which was the ex French ship 'Franklin' which fought at the Battle of the Nile, 1st August 1798. Building began in May 1819 and she was launched on the 10th November 1821. Length 196 ft, breadth 52 ft. Gun Deck: 28 x32 pounders, 2 x 68 pounders Carronades. Upper Deck: 32 x 24 pounders. Quarter Deck: 6 x 24 pounder Congreves, 10 x32 pounder Carronades. 1822 Arrived Portsmouth for fitting out. 1823 Commissioned at Portsmouth by Captain (afterwards Vice Admiral) Sir Edward Brace. Proceeded to the Jamaica Station, returning to England one and a half years later. The daily allowance of neat rum was reduced from a half to a quarter of a pint. This reform was brought about by Capt. Sir John Phillimore with the consent of the crew of the "Thetis" which he commanded. The Admiralty wrote that if the Thesis's ship's company would try it first, they would allow it. This inovation made the ships company of the Thetis unpopular, and even led to fighting, but the crew of the Ganges returning to England, announced that they would not allow the men of the Thetis to be maltreated, as they had found the change most beneficial; it enabled them, they said, to have meat ever day, cocoa, and tea, and gave them two shillings a month extra pay. 1826 Flagship South America Station Captain (afterwards Rear Admiral) Samuel Good Inglefield, flying flag of Rear Admiral Sir Robert Waller Otway, Commander-in-Chief, South America Station. 1828 A Royal Marine contingent landed at Rio de Janerio for the protection of the Emperor of Brazil, in consequence of a serious mutiny which had broken out among German and Irish troops. Emperor Don Pedro in appreciation awarded the RM Officer in charge and Captain Inglefield with the Order of the Southern Cross. 1832 Paid off at Portsmouth. 1832/38 Portsmouth as a 'Demonstration Ship'. 1838/42 Lisbon and Mediterranean stations. 1838 Syrian campaign, Captain Barrington Reynolds - superintended. 1840 Landing of troops at D'Journi, and bombardment of Beirut. Present at blockade of Alexandria. 1842 Paid off at Sheerness. 1848/52 Mediterranean Station. Captain (afterwards Admiral) Sir Henry Smith. 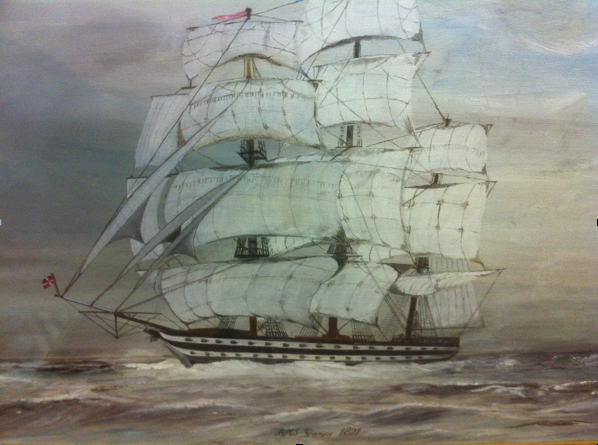 1857/61 Flagship of Pacific Squadron (Rear Admiral Sir Robert Lambert Baynes). 1857 Commissioned at Sheerness - Captain John Fulford. 1861 Returned Spithead, having sailed over 60,100 miles in a three year commission. The Ganges was the last sailing ship to be a sea-going flagship. Paid off at Sheerness. 1899 HMS Ganges sailed to Devonport for keel to be scraped. Boys dispatched to HMS Lion and HMS Impregnable whilst being docked. Two weeks later with boys re-embarked, she undocked and sailed for Sheerness in company with HMS Arrogant, a twin-screw 2nd Class cruiser. It was two months later that she left Sheerness under tow of the tug Alligator, arriving Harwich 11 November. HMS Ganges was now ready to take up boy's training duties. A week before HMS Ganges arrived at Harwich, HMS Caroline arrived to act as hospital ship until proper facilities were erected ashore. Work started on the small hospital for which plans had been drawn up before Ganges had left Falmouth - a disinfector house - was completed by 1900. 1902 Boys march through Ipswich on recruitment drive led by the ship's pet - a fine poodle. Five separate hospital blocks erected, water supply obtained by converting the two Martello towers into storage tanks. Until these quarters were complete, HMS Caroline - one of the 'Satellite' cruisers built in 1882 - acted as a hospital tender to the Ganges. By 1901 sufficient beds were ready ashore to enable HMS Caroline to discharge her patients and return to Chatham to be fitted out as an overflow training ship for the Ganges with accommodation for 60 boys. She was also to be fitted with a swimming bath to take the place of the Ganges' bathing tray, still in use at that time. There is no doubt that the permanent sick quarters ashore enabled the boys to have far better care and attention than had hitherto been possible. 1903 Nursing sisters arrived to take charge of hospital. 1904 Ex HMS Minotaur, ex HMS Boscawen II arrived from Portland and renamed HMS Ganges. 1906 Admiralty orders HMS Ganges to be renamed HMS Tenedos III and to become part of the Boy Artificers Establishment at Chatham. Ex Agincourt, ex Boscawen III renamed HMS Ganges II. 1907 Ex HMS Caroline renamed HMS Ganges. 1910 August. HMS Tenedos III (ex HMS Ganges) towed from Chatham to Devonport to become part of HMS Indus training establishment for boys. Whilst under tow she broke adrift on 24th January off the Royal Sovereign Light, but was secured again and sustained no damage. 1910 13th August. Admiralty orders HMS Tenedos III (ex HMS Ganges) to be renamed HMS Indus V.
1913 Ex Caroline, ex HMS Ganges renamed Powerful III and left Shotley for Devonport. 1918 HMS Ganges II, (ex Minotaur, ex Boscawen II) put in hands of Ship Keepers. 1921 April. Ex harbour launch No.50 renamed HMS Ganges II. 1922 HMS Ganges II (ex Minotaur, ex Boscawen II) towed away by Dutch tug Zwartezee for breaking up. Harbour Launch No.50 named HMS Ganges to become the Depot Ship. 1922 October. Orders for HMS Indus V (Old Ganges) to be renamed HMS Impregnable III and added to the HMS Impregnable Training Establishment for Boys at Devonport. 1923 HMS Ganges (ex harbour launch No.50) replaced by ex harbour launch No.40 as Depot Ship. 1925 January. HMS Ganges (ex Harbour Launch No.40) replaced by steam launch No.218. 1926 General Strike. Ganges trainees helped out at different locations i.e. Coalmines, Waterworks. 1927 RNTE Shotley recommissioned as HMS Ganges, Shotley; without a Depot Ship. 1929 March. HMS Impregnable III (ex original HMS Ganges) Taken out of the Service at Devonport and put under Dockyard control. 1929 August. Old HMS Ganges featured at Navy week. 1930 HMS Impregnable III (ex original HMS Ganges) Broken up at Fish Stand Quay, Devonport. When HMS Ganges was broken up at Devonport in 1930 several items from the ship found new uses. It is believed that the Captain's cabin from the stern of the Ganges is now part of the Burgh Island Hotel at Bigbury-on-Sea, South Devon, England. The authors would like to point out that researchers should be aware of the possiblity of inaccuracies in the information provided for which they cannot be held responsible.